By having strict cancellation conditions we are able to give our guides the best security and contractual arrangements, which means we are able to have the most experienced and best guides for your safety and enjoyment in outdoor activities. Happy guides make happy customers. If people cancel all or part of their booking with less than 8 weeks notice, irrespective of when booking was made with us, we cannot offer a refund. This is because we may have already made employment arrangements with staff or turned away other potential clients. We do, at our discretion, offer vouchers for future activities to people who have to cancel, this is accessed on a case-by-case basis. It is possible to take out insurance against last minute cancellation for reasons such as illness and so on; check travel insurance providers for that. Cancellation by Full On Adventure. It is very unlikely we will need to cancel your activity booking and if we do not offer an alternative in substitution, then we will issue a full refund. We reserve the right to change your activity type for reasons such as, but not limited to, unsuitable weather. An example of this would be changing Canyoning to WW Rafting if the river levels are too high for safety in the Canyon; or changing from WW Rafting to WW River Tubing if the river levels are too low for safety or to enjoyably raft. We also change the activity if not enough people are booked to make it viable, for example if less than 10 people are booked to ww raft then we will change to a closer activity like WW River Tubing or Canyon Gorge. If we do change your activity, we will aim to ensure the substitution is of a similar level of excitement and fun. It is the experience we have to make those substitution calls that has keep us at the top of our industry for safety for more than 15 years. We reserve the right to change your activity or venue for any reason and without giving notice and if people do then not wish to take part in the alternative activity or at the alternative venue offered, no refund will be given. Late arrival of clients: if you arrive more than 15 minutes late for your activity we reserve the right to not take you and not offer a refund, as you may otherwise effect other customers we have or our staffs working hours / arrangements. Your booking with fullonadventure for outdoor activities does not include any aspect of motorized road transportation unless this has been specifically arranged/advised by us in advance. It should not be ‘assumed’ by the client that ‘transportation’ is in anyway included unless we specifically refer to it in the activity information on our website. 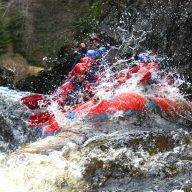 For the activities including but not exclusively, White Water Rafting, Adventure White Water Tubing, River Tubing, Gorge Walking and Canyoning our normal procedure is to meet clients at our changing room location, give you the equipment and then clients follow us in their own transportation ( cars mainly) to our activity venues. We do ( when we have covers in stock) offer clients plastic seat covers to help keep their car seats dry on the return journey to the changing rooms. 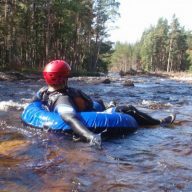 River Tubing and Adventure WW River Tubing are around a 10-15 minute drive, each way, from our Aviemore changing rooms to the venue, Gorge walking around 20mins drive each way, Canyoning 50mins drive each way, ww rafting around 45mins drive each way. If you are planning to arrive at our changing room without a method of ongoing transportation ( for example you came on foot or were dropped off by a taxi/bus ) then you will need to ask us in advance if we can either provide or recommend transportation solutions for you which may involve additional changes which would be advised at the time at which you request it. We are much better able to make effective transportation assistance solutions if you give use plenty of notice prior to the date of you activities, by which i mean 2-3 weeks notice. The Standup Paddle boarding activity does not require transportation as we walk from the changing room to the river which is about 5-10mins. For kayaking trips on the river spey and family float rafting trips on the river spey, we will normally be providing a shuttle service for free, check with us if unsure. 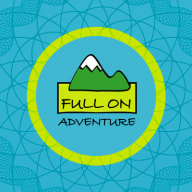 Full On Adventure may use your email address to send you information about our courses in the future but will never share those details with any third parties. Any mailing from FOA will have an opt out unsubscribe link on it so you can leave at anytime you wish. Payment details are not kept and all our card processing payment gateways are PCI compliant. For group bookings the main contact is responsible for communicating these conditions to all members of their group. To read and accept our risk declaration information prior to participanting in activities on the day or your activity. We can email those to you in advance if requested, you will automatically be emailed a copy once you accept them. Payment may be made by all major credit and debit cards over the phone, online on our website, bank transfer to our account 09-01-28 03844875 ensuring you note your transfer with your name or by mailing us a cheque, payable to Full On Adventure Ltd and enclosed with your booking form; sent to our office address: Full On Adventure Ltd, Adhara, Carrbridge, Inverness-shire, PH23 3AX.